I quite enjoyed last week’s Under the Lake – a traditional base under siege story with an interesting angle on the Doctor and Clara. 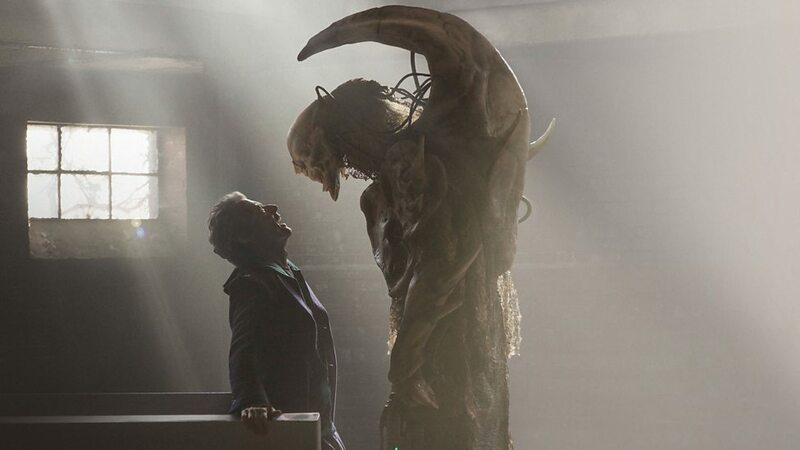 The second part of the story, Before the Flood, is a different beast – it drops "traditional Who with a sense of humour" in favour of "timey-wimey with a bit of arthouse". Let’s start with that audacious opening scene – the Doctor explaining the bootstrap paradox to camera before accompanying the opening credits on his electric guitar. As a scene, considered on its own merits, people will love it or hate it. I loved it – I love the rock n’ roll side of Capaldi’s Doctor, I love the professorial side of him, and I’m always up for a bit of mucking with the format – but I understand if you feel different. What didn’t work is – why here, why now? Doctor Who has done similar paradoxes many times before without the need for a lengthy explanation. Plus, the events in this episode aren't even the same paradox as in the Beethoven story they're parallelled with – our hypothetical time traveller accidentally becomes Beethoven, whereas the Doctor knows exactly what he’s doing. That question of ‘Why?’ recurs throughout Before the Flood if you stop to think. Why the scenes in which the Doctor goes back on his own timestream? They give some nice visuals, but add little to the story. And why spend so much time setting up the importance of Clara’s phone only for it not to be used again? And, importantly, why not spend some of this time actually setting up those two relationships “paid off” at the end? I can’t have been the only one cringing at that final scene with the surviving base crew. They were all secretly in love with each other. Right. The only scenes that could have possibly set that up were those of Cass being protective of Lunn, but, you know, colleagues and friends are protective of each other too, probably more so when they rely on those colleagues to be able to communicate with the rest of the team. Another thing that really didn’t thrill me was the reveal of the Fisher King. Nice name, but he’s ultimately a generic evil alien, a tall man in a silly suit. I kept noticing how unemotive he is – the Doctor would shout threats at him, and the Fisher King would wiggle those little red arse cheeks that are presumably meant to be some kind of mouth. If Under the Lake resurrected the old Doctor Who tradition of a base under siege, this episode brings back the old tradition of a very talented actor doing his best to maintain an ultimately hopeless tête-à-tête with a slab of rubber. I feel I’m being too negative here. What did I like about Before the Flood? It used time travel as a plot device without becoming messy or confusing. There were some nice moments of characterisation for Clara and the Doctor (if not as many as last week), with Clara getting her own ‘companions’ of sorts and being called out on gaining the Doctor’s recklessness. If I’m being generous, I could say that O’Donnell’s death ties into this as a warning for Clara about the dangers of treating life with the Doctor as a thrillseeking experience. The fact that Prentis’ business card says “May the remorse be with you” made me laugh. And the scene with Cass being stalked by Moran was good horror stuff, while again allowing her to turn her disability to her advantage (though on second viewing, I did wonder whether she should have just looked behind her rather than feel for vibrations in the floor). Put the two parts together, and you have a two-parter that’s… well, I’m not eager to watch them both together to find out. All the good stuff – the best jokes, the best characterisation, the most interesting parts of the mystery – were in the first episode. Would it have worked better as a single episode? Maybe the plot would have had fewer unnecessary tangents, but then again, Whithouse didn’t manage to give some characters the minimal development they needed with two whole episodes to do so. Here in particular, the characters were flat, the villain naff, the plot drawn out – altogether, Before the Flood was a bit boring. Next week: Vikings! Maisie Williams! Jamie Mathieson! If ever I wanted a Who episode to not let me down, it’s this one.